UC Davis is installing a second set of blue-light, emergency call stations — and, in this round, officials have chosen sites in the central campus, in the vicinity of Shields Library, the Quad and the north side of the Memorial Union. Map shows locations of four new call stations and an existing station near Wyatt Deck in the arboretum. The first set of call stations went in two years ago: seven along arboretum paths and one in UC Davis West Village (specifically, at the west end of the Highway 113 overpass for pedestrians and bicyclists, connecting West Village and the main campus). The call stations, even if students do not need to use them, offer reassurance that help is just a call away, said Jeff Rott, security director with the Police Department. “And our students have been asking for more,” he said. So, when funding became available through the UC system’s Violent Acts Mitigation Program, UC Davis police, Risk Management and Emergency Services secured $100,000 for four new call stations. Additional grant funds may be available for other campus security projects over the next four years. In studying possible locations for the new call stations, Rott and other safety officials started with the campus core. They also consulted further with students. For example, while participating in the Campus Safety Lighting Walk last January, Rott asked student volunteers where they would put the new call stations. 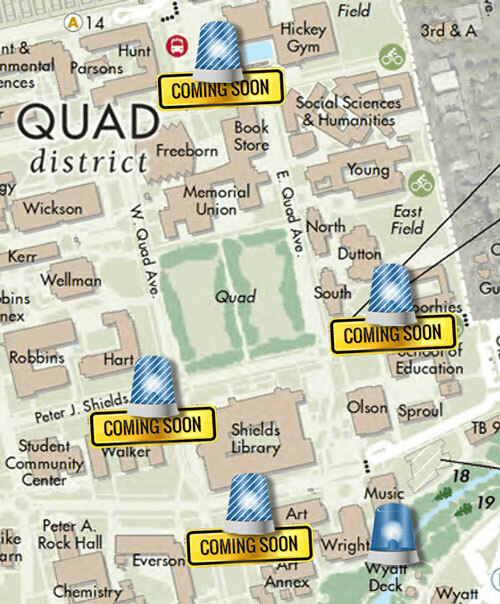 They suggested locations in the vicinity of Shields Library’s 24-Hour Reading Room. The fourth new call station is going in at the south end of the Memorial Union bus terminal, across from the MU. This call station sits along an arboretum pathway near the south end of Lake Spafford. All of the new call stations are easily accessible by patrol car — so police officers can drive right up to aid the people who make emergency calls. While waiting for the call stations to arrive from Code Blue Corp. in Holland, Michigan, campus crews are preparing the sites by pouring concrete pads and installing conduit where necessary for wiring. The project is a collaboration among the Police Department, Campus Planning, Facilities Management, Transportation Services and Communications Resources. Rott said he estimates the call stations will be operational by the end of the year. The new call stations will look and work just like the first eight on the campus, with one change: the new phones will connect with police dispatch through the internet (in conjunction with the campus’s move to voice-over-internet protocol, or VoIP, phone service). The seven emergency phones in the arboretum are hard-wired — that is, connected by wire to police dispatch — while the West Village phone is wireless. Each call station — existing and new — also includes a motion-activated camera. So, when a call comes in, dispatchers can see what’s happening in the vicinity of the call station and advise responding officers of the situation they will encounter. Similarly, dispatchers can activate any of the cameras at any time to see everything within range. This can be useful when police have a report of suspicious activity in the general vicinity of a call station, because the camera may be able to detect what’s going on and where a suspect or suspects may be located.